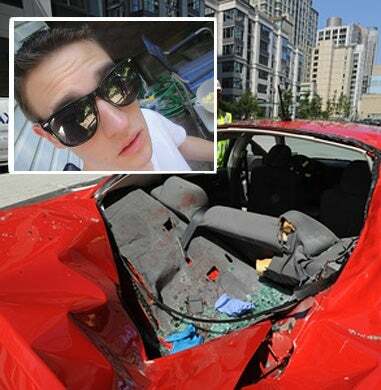 Thomas Magill apparently attempted to end his 22 years of life by jumping off a high-rise building on the West Side of New York yesterday, only to survive by landing on a 2008 Dodge Charger parked 39 floors below. Thomas Magill is a 22-year-old New Yorker not unlike most twentysomething New Yorkers, according to his Facebook page. He studied English at Fordham University, and had a job as a "stylist" at Club Monaco until recently. His family's from Staten Island, but the New York Daily News says he once lived in the building he jumped off of yesterday. There are a few bits that stick out, like on his "Favorite Quotations" page where he includes these two comments. It seems significant in hindsight, but there's no way to know outside of the context. Also, "the ferry docks in period water" is a strange statement. Most tellingly, he apparently really likes The Decemberists and his interests include "Making Fun of People" and "Being Mean." According to witnesses, Magill flailed on his way down before landing feet first on the red Charger, crushing the roof and breaking the glass. The owner of the car's a construction worker from New Jersey who claims a set of rosary beads in the car are "what saved him."